Last year for my birthday, my best pal Maria gave me two incredibly thoughtful and unusual gifts. One of these gifts was a book about how to make balloon animals, accompanied by at least five pounds of balloons. This blog post is not about that gift – although, my gosh, if a blogger ever needed something quirky about which to blog, that would fit the bill. Instead, this post is about the other gift: something fabulous that is orange and elbow-shaped, comes in a bowl and heats up in no time. Suzy Gruyere has one, and Hilary Havarti has one, and very soon one lucky weheartmac reader will have one too. The magnificent macaroni and cheese candle, by kokocandles. To celebrate our one-year blogaversary, Hilary and I are having a little contest. Enter today – the deadline, like our next meal of mac, is coming right up! As is the case with all the best gifts, some assembly is required. 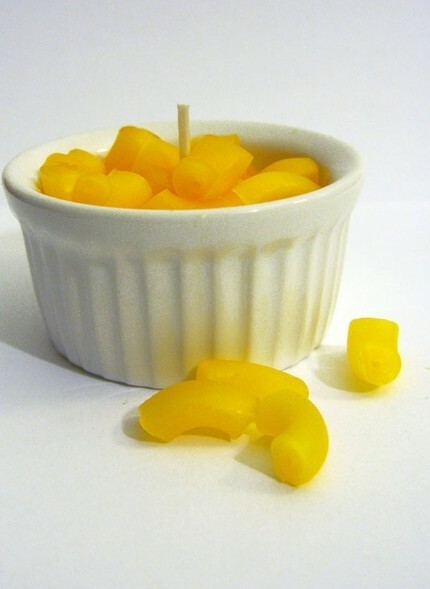 Our lucky winner will receive one small ceramic ramekin, two candle wicks and enough macaroni-shaped candle bits to provide 14-20 hours of burn time. By our reckoning, that’s two to three weeks worth of romantically illuminated cheese-enhanced suppers! Or light it in a ceremonial fashion each time you embark on another new mac recipe! 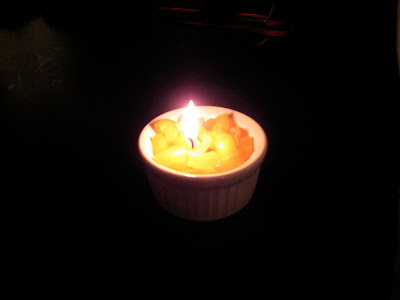 Enter our contest and let us shed some soft, flickery light on your macaroni and cheese adoration! Happy Blogiversary! You had me at calorie-free!